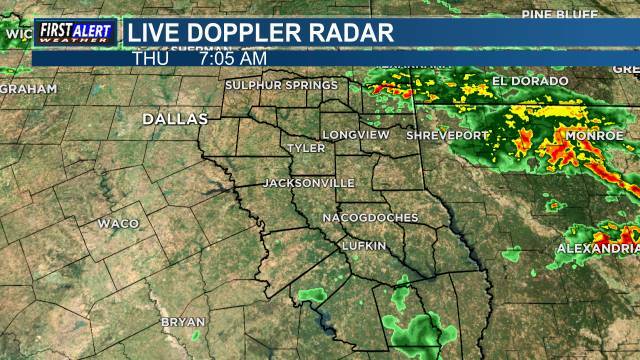 EAST TEXAS (KLTV/KTRE) - Here’s the weather where you live: A mostly cloudy day today with spotty showers expected. If you are not seeing rain in your area, expect cloudy skies. Winds will be gusty this morning but will start to relax into the afternoon. Temperatures will climb into the low 60s today with our more southern counties a bit warmer. Overnight lows will sink to the low 50s. Tomorrow we will keep the clouds and spotty showers with temperatures a bit warmer, in the 70s. We are expecting more widespread showers, thundershowers, and possibly isolated thunderstorms to pass through East Texas on Wednesday. A cold front will come through late Wednesday early Thursday and it will take away the clouds and rain but bring cooler temperatures with it. Sunshine will come through on Thursday with temperatures in the 60s and will stick around through the weekend. Temperatures will drop into the 50s Friday and Saturday but will warm back to the 60s by Sunday.